October is Vegetarian Awareness Month, the time of year when we are asked to see things from a different perspective and try something new. For those of us who haven’t tried it, there are some simple options for celebrating this event, if you want to start out small. Everyone celebrates in his or her own way, of course, but here are some easy steps you can take to eating a little healthier and seeing what vegetarianism is all about. Try to participate in Meatless Monday. Meatless Monday has become extremely popular in the last few years. It calls for everyone to take a day out of their week (Monday, to be specific) in which you don’t eat any meat. This is a great way to dip your toe in and see what it’s like to be a vegetarian for a day. Try growing your own veggies. Growing your own vegetables will not only be great for the environment, but it will enable you to eat more vegetables than you normally would. You won’t have to sift through partially rotten veggies at the grocery store; you’ll have fresh produce right outside of your house. Educate yourself and others. Take a moment to put yourself in another’s shoes. Don’t just dismiss something that you don’t know anything about. Educate yourself. Learn more about what vegetarianism means, beyond just “not eating meat”, and then take that knowledge and spread it to others. Try steering clear of meat when dining out. Go for the salad or pasta instead of the burger or steak the next time you go out to a restaurant. Give it a try, and see how you feel after. You won’t be too full, too tired, or too bloated. Share vegetarian recipes with others. Find a vegetarian or vegan recipe and share it with your friends and family. Better yet, cook it for your friends and family and watch them enjoy it for yourself! 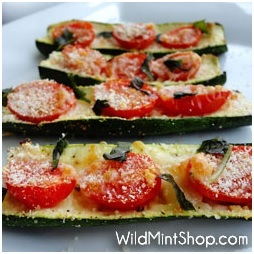 Here’s one of our favorite vegetarian recipes for a great zucchini appetizer for the whole family. Cut zucchinis in half, lengthwise. To help the boats sit still on a baking dish, trim a little of the bottom off each boat (the outer skin/edge) for a flatter surface. Scoop out the seeds in the center with a spoon. (reserve seeds for something else…like a pasta sauce or in soup or muffins!). Arrange the boats on a baking dish with the inside facing up. Brush the surface of each zucchini with garlic, olive oil, and a little salt and pepper. Arrange the grape tomatoes into the zucchini boat grooves. Sprinkle each boat with breadcrumbs. Remove boats from the oven and place the diced cheese in between each tomato. Remove boats from the oven, drizzle with a little more olive oil and sprinkle with grated parmesan cheese. Top with fresh basil. Want more recipes like this? Visit our friends at WildMintShop.com!